Lymph nodes of the armpit are known as the axillary lymph nodes. These nose are usually not palpable (felt by touch) but may sometimes become swollen, hard and/or painful. This can arise from a host of possible causes ranging from minor injuries to infections and even cancer. Apart from the armpit itself, disorders or diseases of surrounding organs may also cause axillary lymph node swelling. 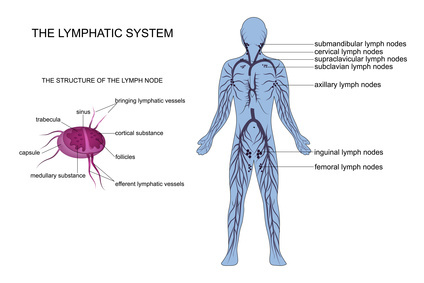 Lymph nodes are small, round or oval glands that are found all over the body and form part of the lymphatic system,. They are an integral part of the immune system. It helps the body to fight against infections while removing interstitial (tissue) fluid and returning it to the blood stream. The lymph nodes act as filters to trap and destroy bacteria, viruses and other harmful substances that enter the body. Normally the lymph nodes are not palpable but may enlarge as a result of some disorder or disease. The lymph nodes of the axilla (armpit), inguinal region (groin), and neck tend to enlarge more frequently than other areas. Localized lymphadenopathy, where the lymph nodes of a single area are affected, may also be accompanied by lymph node swelling elsewhere. If this occurs, then it is considered as generalized lymphadenopathy and the cause of the swollen lymph nodes may likely be a systemic factor. an outer (lateral) wall formed by the arm. inner (medial) wall formed by the chest (thorax). front (anterior) wall made up by the pectoralis major muscle. There are five groups of lymph nodes in the axilla associated with each area – the central, lateral, medial, anterior and posterior groups of lymph nodes. Lymph nodes that are swollen due to infections tend to be firm and painful. Enlarged lymph nodes due to cancer are usually firm or hard in consistency, fixed (not freely mobile), usually not painful, and may be matted (stuck to each other). They may also increase in size over time. In some cases the lymph nodes may be felt, without the presence of any disease, but are usually small (less than 1 cm in size), soft and painless lumps. Cysts and abscesses under the skin in the armpit may produce lumps which could be mistaken for enlarged lymph nodes. Local causes refer to diseases in and around the armpit area and not only of the breast. For example, breast infections or even breast cancer can cause swelling of the armpit lymph nodes. Systemic causes refers to diseases that may be present throughout the body. These conditions do not only cause enlarged armpit lymph nodes. Swollen neck lymph nodes or swollen groin lymph nodes may also be present or occur in isolation. Injury to the armpit, arm or hand. Localized infection in the armpit or of the arm, hand or breast, which drains into the axillary lymph nodes. Cat scratch disease is an illness which is caused by the scratch or bite of an infected cat. Cats act as carriers of the bacterium Bartonella henselae which causes cat scratch disease although cats do not suffer from the disease themselves. There may be generalized symptoms of fever, headache, loss of appetite and fatigue along with lymph node swellings, especially of the head, neck and axilla. Cat scratch disease normally resolves on its own without any specific treatment. However the infection may be more debilitating in persons who are immunocompromised like in HIV/AIDS patients or those on chemotherapy for cancer. Cancer in or near the lymph node. Benign tumors of an organ usually does not cause lymph node swelling. Lymphoma is a cancer of the lymph node. Breast cancer may cause swollen axillary lymph nodes since the lymph vessels of the breast drain into the lymph nodes of the armpit. These nodes become enlarged when cancer cells spread beyond the breast tissue. The condition of the axillary lymph nodes is very important for staging of breast cancer which can help to determine the prognosis and clinical course of the disease, as well as indicate the best treatment option. Axillary lymph node status may be taken as the single most important factor which helps to determine the prognosis and survival rate of patients with breast cancer. Melanoma is one of the most dangerous types of skin cancer. It may metastasize (spread) to the nearby lymph nodes. Brucellosis is also known as Undulant fever, Malta fever and Mediterranean fever. This disease is caused by the different strains of the Brucella bacteria which may infect animals such as goats, cows, pigs and dogs. It is spread to humans coming in contact with infected animals, eating or drinking unpasteurized dairy products. Flu-like symptoms may be present such as fever, headache, backache, joint pain, chills, fatigue and poor appetite. Muscle pain and swollen lymph nodes (including axillary lymph nodes) may be associated with this disease. Brucellosis may present as an acute infection or it may become chronic and can persist for years. Silicone breast implants may trigger a foreign body reaction to the implant itself or due to leakage from the implants. These complications of breast augmentation may cause axillary lymph node enlargement as well as breast swelling, tenderness and/or breast pain. Perfumes, deodorants and certain cosmetic procedures like hair removal from the armpit may also cause an allergy or inflammation in the area with or without enlargement of the surrounding lymph nodes. Contact dermatitis, folliculitis or an armpit fungus may also develop on the skin of the axilla and cause swollen armpit lymph nodes. Systemic causes of lymph node enlargement may be involved in causing swelling of the axillary lymph nodes before more generalized lymph node involvement becomes apparent. Infectious mononucleosis (Epstein-Barr virus) which produces symptoms of fever, sore throat and fatigue as well as enlarged lymph nodes. Cytomegalovirus (CMV) infection which is similar symptoms as mononucleosis. Lymphadenitis is an infection of the lymph nodes, which may be result as a complication of certain bacterial infections. Sporotrichosis is a chronic skin infection caused by a certain type of fungus found in vegetations such as rose bushes and briars. Small, painless, red lumps appear following an injury, usually on the hands or arms, and may go on to involve the lymph nodes. MMR (measles, mumps, rubella) vaccine side effects. Hodgkin’s lymphoma is cancer of the lymph tissue present in the lymph nodes, spleen, liver, bone marrow and other sites. It initially starts in a single lymph node , spreads to nearby lymph nodes and then to other organs such as the spleen, liver and bone marrow. Painless lymph node swelling of the axilla, neck or groin may be accompanied by fever, chills, night sweats, fatigue, weight loss, itching and various other symptoms. Allergic reaction to sulfur (sulphur) drugs, penicillin or iodine.